There was a very good entry this year, with two beginners producing excellent work. There were a wide variety of scarves, gloves, skeins, flowers and toys. 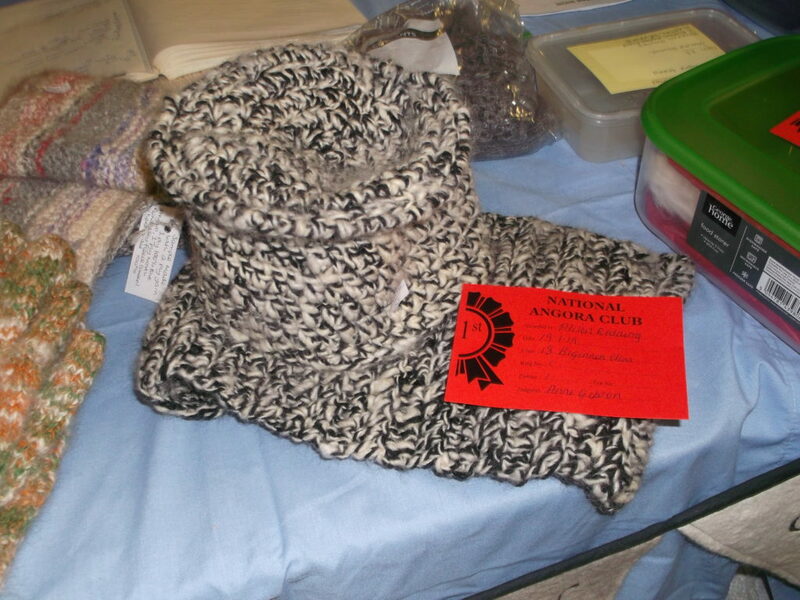 Lovely work from members on the Angora Club stand. 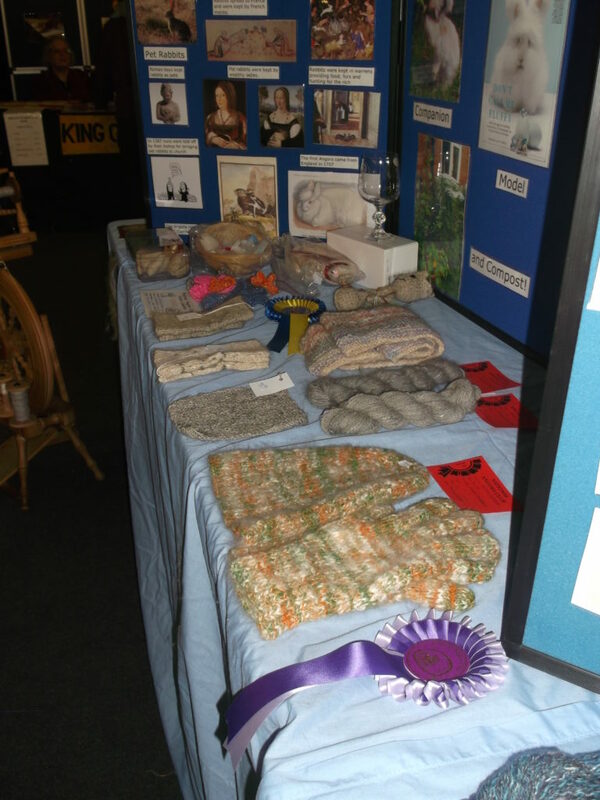 Sally May’s wheelspun Angora single ply won best yarn. The Judge, Anne Gibson, found it very difficult to choose between this finely spun Angora chemise from Mary Tomlin and the beaded shawl from Lesley Hordon. 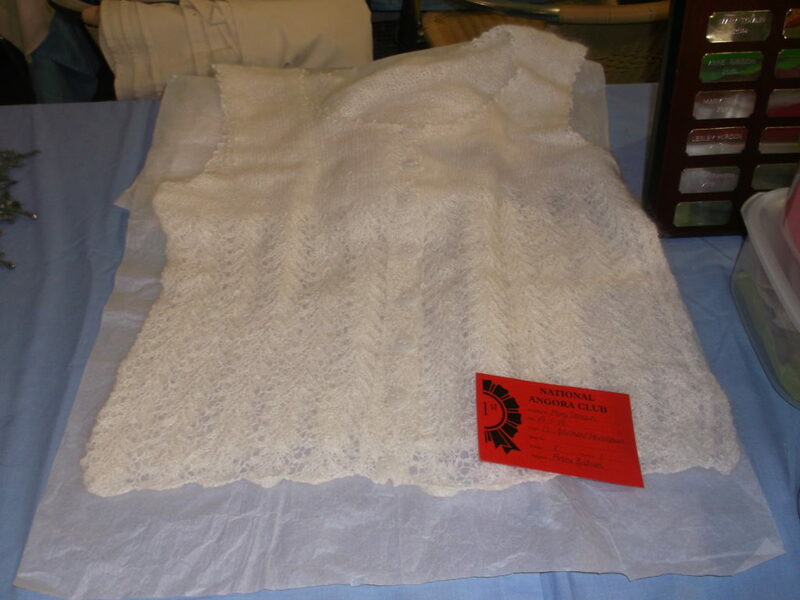 Beautifully spun and knitted, Mary Tomlin’s Angora Chemise. 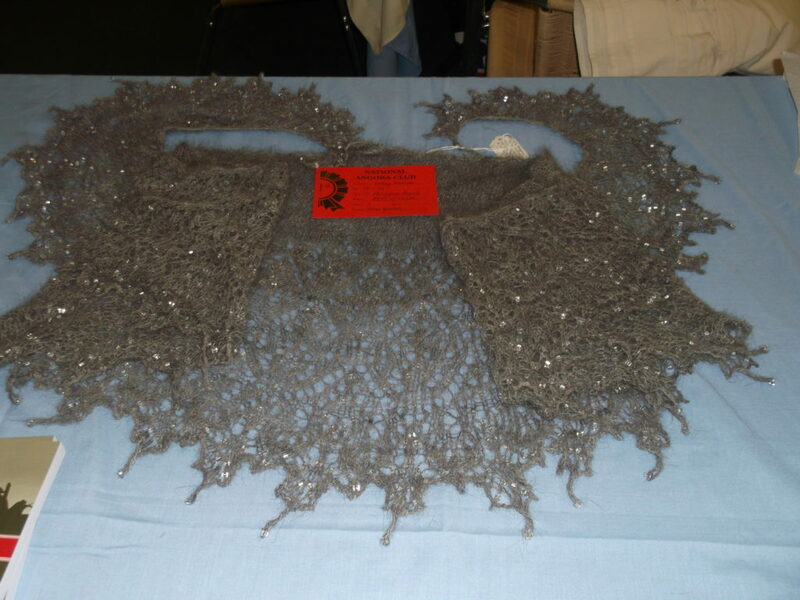 A beaded Angora shawl. From Cheyenne, a 5 year old Smoke Angora. 75% Angora, 25% slate dyed mulberry silk, with a little onyx Angelina. Spindle spun. Pattern Voodoo, by Boo Knits. 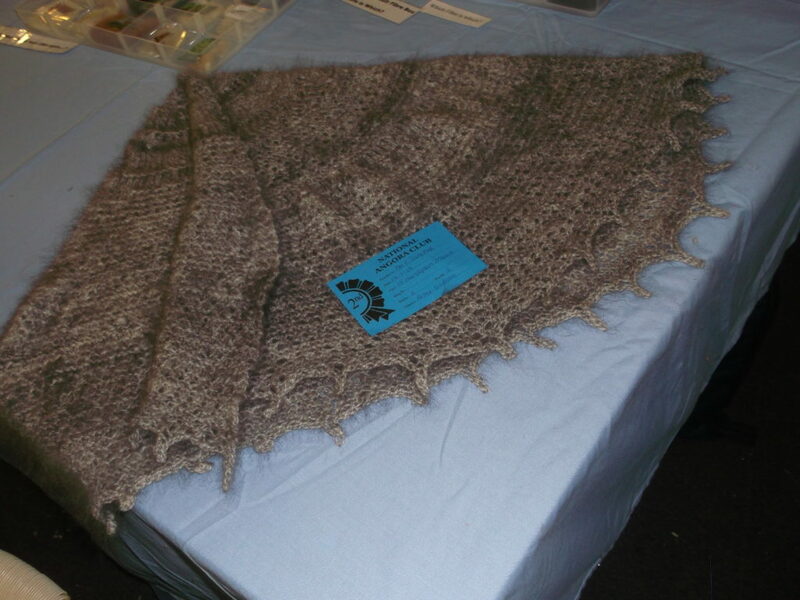 The beaded shawl by Lesley Hordon was judged Best in Show. The felted beaded scarf on the right was made by Rebekah Staples. 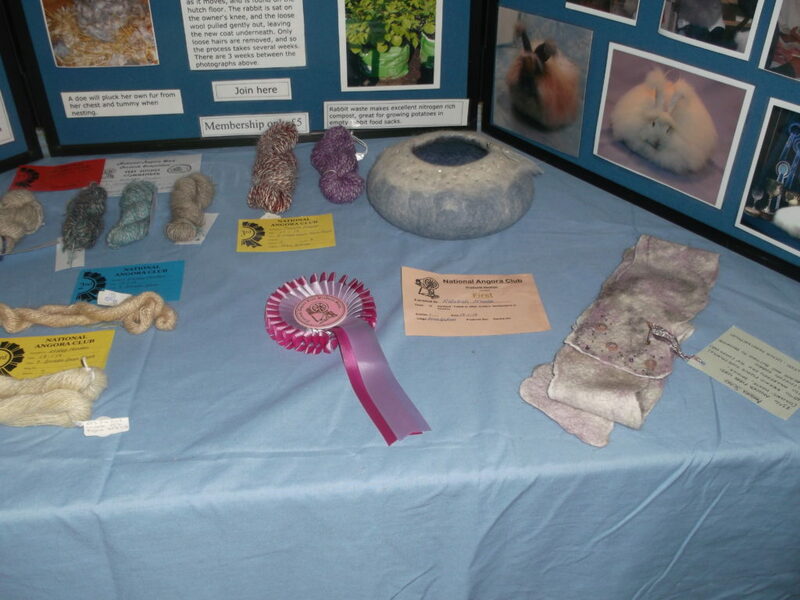 The bowl on display is also a sample of her felting work. The scarf was 73 % angora, 25% merino tops, 2% silk tops on chiffon fabric. It was decorated with seed beads and buttons. Rebekah also produced the best spindle spun yarn. The next Products Show is at the London Show in October 2019. This is held at the East of England Showground in Peterborough. Please see the Club yearbook for the schedule for entries. All members can enter. If you cannot spin or knit, you can still enter your clipped Angora wool. Free spindle spinning lessons will be available at the Club Stand at the London, and also at the craft shows throughout the summer. Posted 28/01/2019 by LH & filed under General interest, Rabbit Shows.